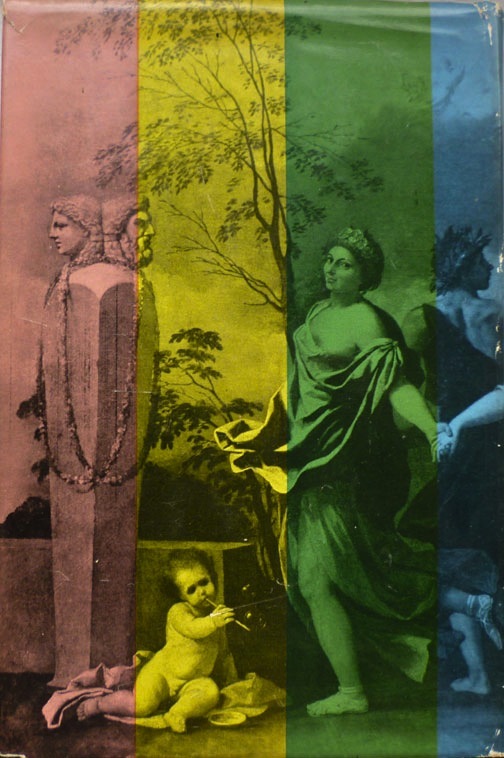 NB: Linked in this week's Friday's Forgotten Books. A Dance to the Music of Time by Anthony Powell. 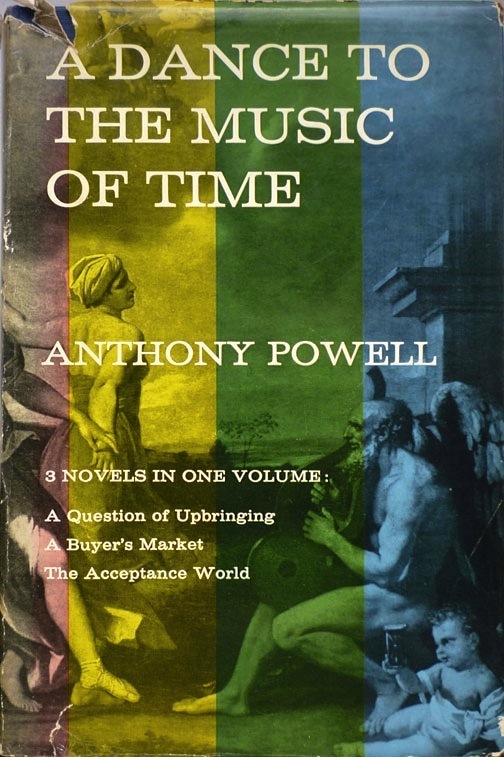 Published by Heinemann in 1962, it's the first British omnibus edition of the initial three books in Powell's twelve-volume (as it would eventually number) A Dance to the Music of Time sequence – A Question of Upbringing (originally 1951), A Buyer's Market (1952) and The Acceptance World (1955) – and is really rather uncommon in this edition: there are just two copies on AbeBooks at present, both jacketless, both offered by American sellers, priced at £35–£60. Whereas this copy does have its dust jacket (albeit a little chipped and sunned at the spine) and set me back just eight quid. 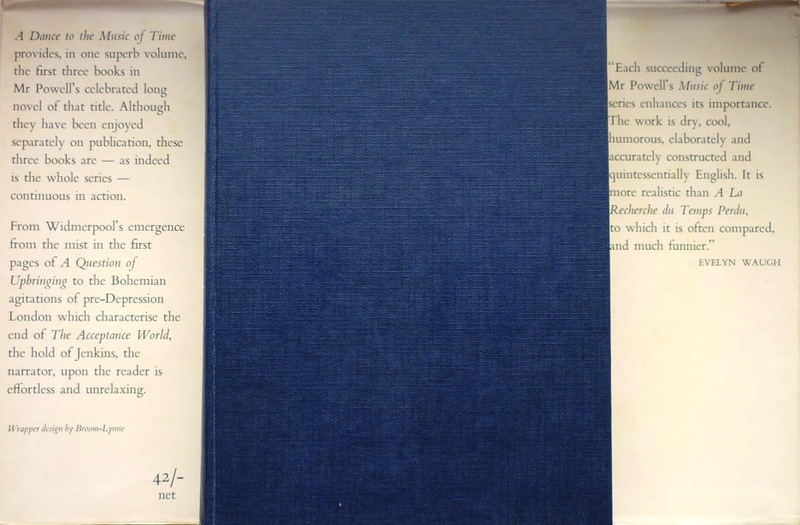 According to one of those American AbeBooks sellers the Heinemann omnibus was "Published in an edition of 3,000 copies, on Dec.3, 1962, eleven months after the US [Little, Brown] 3-in-one. 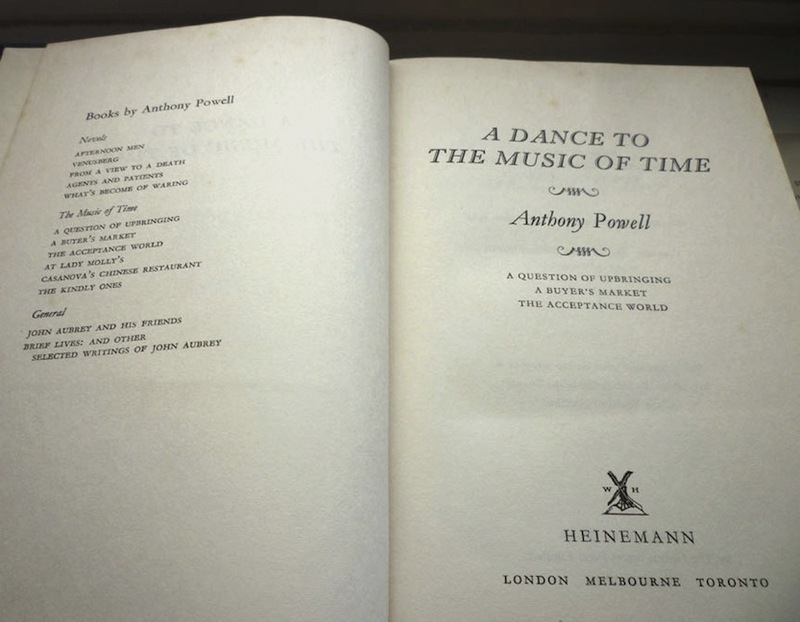 Powell credits the US omnibus volume with the commercial success of the Dance. 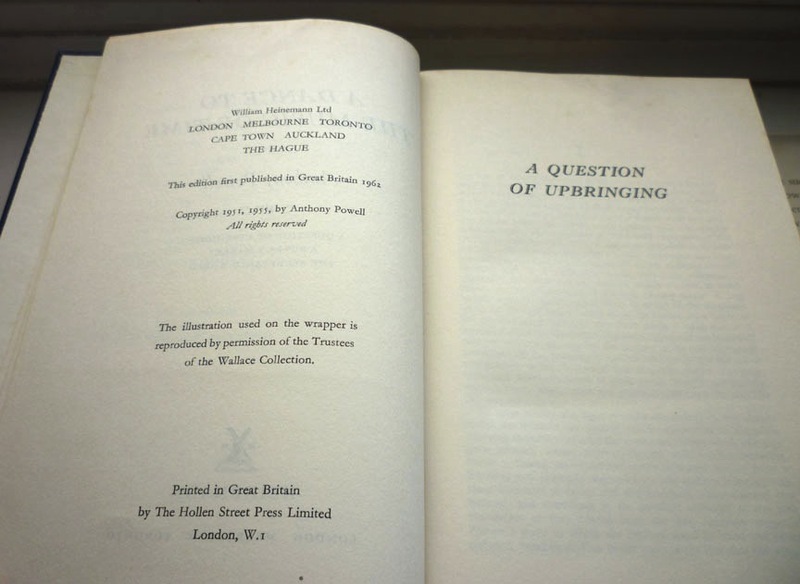 The British omni, however, never took off and this is the only one published by Heinemann." That's as maybe, but my research suggests it did well enough for Heinemann for them to issue a reprint in 1964. Still, it's a scarce volume, and one to treasure. The little-seen dust jacket was designed by James Broom-Lynne, who designed all twelve of the wrappers of the original Heinemann editions of the Music of Time novels (among many others, including Adam Diment's The Dolly Dolly Spy, to take an example from my own book collection), and utilises Poussin's 1634–1636 painting A Dance to the Music of Time – from which Powell got his overarching title. It's an attractive treatment, and certainly good enough to take its place in my Beautiful British Book Jacket Design of the 1950s and 1960s gallery. 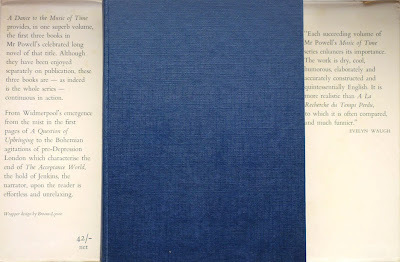 When the Music of Time sequence was complete in 1975, with Hearing Secret Harmonies, I wrote and read a huge lecture... on the thing as a whole. Putting it together involved, of course, slow and careful reading of each volume and the taking of copious notes. This had the distressing side-effect on me of making the books unrereadable, so far at any rate, though I mean to return to the charge in the not-too-distant future. I ought to have foreseen this, having published a short book on the works of Ian Fleming, The James Bond Dossier, in 1965, with a roughly comparable amount of work required and the same lasting result. But most people will think this a less lamentable deprivation. That sly last line made me smile, but I wonder if Amis, who died in 1995, ever did revisit the sequence. Anyway: that was the last of the books I bought in Halesworth. Next in this prolonged account of mine and Edie and Rachel's summer holidays we'll be heading to the seaside, and thereafter, slightly incongruously, to church. Just out of curiosity, do you collect vinyl too? 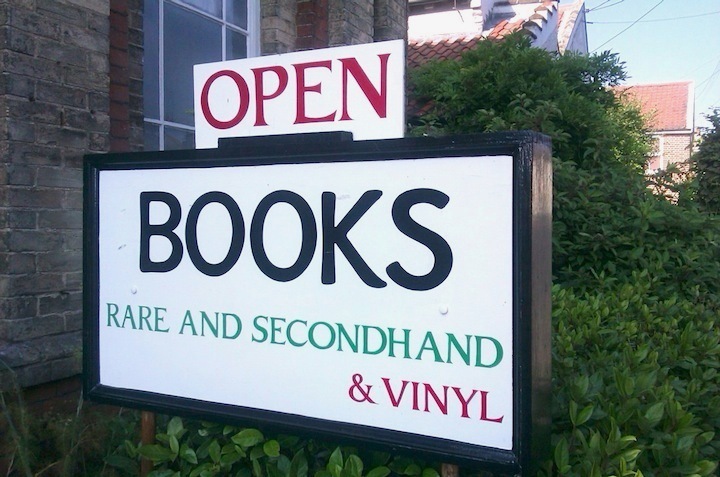 Not so much these days – I didn't even glance at the records at the bookshop where that sign is – but I used to, and still have a fairly big vinyl collection. Mostly indie stuff from the 80s, 90s and early 2000s, plus dance music 12"s from my 90s Mixmag days. I tend to just buy CDs now (as with ebooks, I'm afraid I'm largely averse to downloads). I grew up with several paperbacks of this series in my parents' bookshelves and remember asking my dad what they were about and his reply that they were grown up and that I wouldn't really appreciate them. Years later, I stumbled across the entire series in beautiful paperback editions in a used bookstore on E.14th street (memorable for its horny cat whom I once observed making love to a feather duster in the back aisle). I bought them three at a time and read them all, loving every minute. His prose is just so rich and the characters so memorable and real, funny and maddening. Even then, in my late 20s, I still wasn't really appreciating them, as I never could quite get Widmerpool (you'll see). I read the series again maybe 10 years later and then realized how real Widmerpool was (even having several near-Widmerpools of my own in my life). Fantastic series and now that you've posted about it, it makes me feel like reading it again. Aha, another Powell enthusiast! I'm starting to get the impression that all the best people like Powell. I've wanted to start reading the Dance series since I read a nice review a handful of years ago. But, I admit to being intimidated by tackling 12 novels. Yes, that does slightly worry me too, Gerard, especially when I have so many other series to finish.